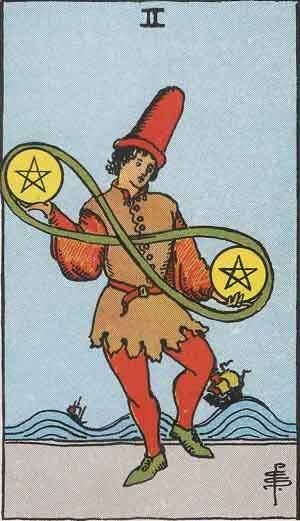 The Two of Pentacles is the second card in the suit of Pentacles. Two is a common number in esoteric study and understanding; balance, two halves of one whole, male and female, good and bad. Generally a positive card, the Two of Pentacles can remind us to respect the balance that our lives require. The Two of Pentacles represents balance, dualism and partnership in regards to material possessions. Past – The Two of Pentacles in the Past position can represent a life of constant change and adaptation. You may have moved locations or changed greatly as a person. Think about the good aspects of each and keep them, try to get rid of the bad habits. In that recent past you may have had to make a choice between two things, two major paths in life. You have chosen and are living with the consequences of that choice. Present – The Two of Pentacles in the present position has a few meanings. You could be balancing two aspects of your life; work and play, certain family and friends. This can be both good and bad, but as long as balance is retained and you are comfortable, then things should continue to go well. Try not to get stuck living your life for other people. Sometimes we have to be selfish. As the past definition suggests, look out for a choice between two paths soon. It may be something which changes your life forever, and there will be many aspects of each choice to consider. Neither choice is good or bad, they are just different. Future – The Two of Pentacles in the future position represents a wholesome balanced life if you continue positively. You need to address your current problems for future growth. Imagine yourself in five, and ten years. How are you? Are you living the life you expected? Rarely do we actually live to follow our plans in life, but know that if you dedicate yourself, then you can at least live a happy, balanced future. Work / Education – The Two of Pentacles in regards to work or education means that you need to focus on fewer things and do them well rather than trying to balance many different tasks. Try to prioritise, things aren’t as serious as they seem. Work only within your remit if you can, that is to say that you shouldn’t take on anything voluntarily right now if you can help it. Complete your responsibilities first, then move on to help others, and then finally go on to do more for yourself. Romance – The Two of Pentacles in romance can mean that your relationship or lack of it needs to be a higher priority for you. Are you spending enough time with each other? Are you growing closer or apart? You can think about it a lot, but usually your instinct is correct. If you’re single, do you really want a partner right now? You have to work out what you want and how, if it’s possible, how it is going to fit into your current life. Negative feelings of past relationships can affect our future choices, but remember that not everybody is the same. The love you had for somebody in the past will affect how you feel now, but try not to project personalities from previous partners onto new ones. Meet new people, see more. Friends – The Two of Pentacles in regards to friendship means things are okay. They could be better but your friends are helping support you, and you them. Are these friends true friends, and likewise, are you theirs? Is any party in the relationship parasitic, making it a one sided relationship? It might be time to phase them out. Money – The Two of Pentacles in regards to finances once again turns to balance. If things are hard, check how much is going out and coming in and adapt accordingly. Stop buying things that you can make, and that includes meals. You can cook and prepare your own food with little effort, and you’ll be all the better for it. Don’t resort to buying through laziness. If you have lots of savings, then see if your family need helping out. They will really appreciate you for it. Health – The Two of Pentacles is good when placed for health. Balance is an important aspect in health; intake and output need to be balanced, food groups need to be balanced, calories and sugars need to be taken in sensibly. Relaxation and stress too. Think about what you don’t like about your body and try to change it through established means. Spirituality and Mentality – The Two of Pentacles in spirituality means that now might be a good time to help others sort themselves out. You can be a great help for someone in distress right now by being an impartial voice of reason. Actively look to give advice. Look for imbalance in your life and search for ways to fix it. You might have too many things on your plate right now, too many projects or goals, ambitions and aims. this isn’t necessarily a bad thing, but the Two of Pentacles reversed suggests that it isn’t right for you. Things should be in balance, in harmony. Two represents duality, partnership and sharing. All twos symbolise this. The Two of Pentacles in a numerological sense may reflect that your life is currently quite balanced. If you have a lots of Twos in a reading, it is a strong indication that your life in general is going to be okay, things could be better, they could be much worse. If you’re having trouble balancing your life, work out where you are exerting too much energy and where not enough is being applied. As a Yes or No question: The answer isn’t a simple yes or no. We’ve selected live tarot readers to give you a FREE 3 Minute interpretation of The Two of Pentacles! Scroll through them below and pick your favorite one.